In March, Doug Kass correctly called a major bottom in the market. Now, he believes the situation has changed dramatically and we are now at the highs for the year. Navy visits Ohio State September 5 for the Bucks’ season opener. I won’t be there, but the crowd is going to show it’s appreciation for the armed forces by standing and cheering the Navy team as it takes the field. We put the top down on the green Miata and headed to McCreary County yesterday on a cool, sunny, perfect day. At Stearns, Kentucky, we visited the McCreary County Museum and rode the Big South Fork Scenic Railway. The destination was the Blue Heron Coal Camp historic site, which is a national monument. Pictures are on my Flickr page and can be accessed to the right of this post. 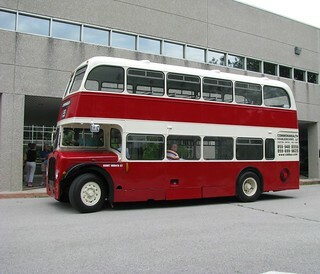 Last Saturday we rode to Paris (KY) in a 1955-model double decker bus. We went on a tour of Claiborne Farm, and had an excellent lunch at Campbell’s Restaurant in downtown Paris. The bus was loud but kind of fun. I don’t think it was capable of going more than 40-45 MPH. At least it didn’t seem to ever exceed that speed. Of course, it has no “native” air conditioning, but the owners are installing some electric units. I don’t think they use them while in motion, as it would take precious power off the engine. At the farm, we saw Eddington and Pulpit, two of the many horses that stand at stud. Pictures are on my Flickr page.